...and please, keep comments civil. Thanks! Additionally, no one at Kiesel Guitars has any info has to how long their liquidation sale will continue, or how this impacts things like warranty/service, etc. If you need help with Carvin Audio gear, your best bet would be to reach out to them via their Facebook page. Fascinating how times changed. Only a couple of decades ago, it was the instrument line that was going to be jettisoned. One generation later, and the tides/industry turned. I wonder if Steve Vai will continue to use his old gear, or switch to a new company? BTW, good to see you Kevio. It's been a while since you had a chance to post. Bummer that it is around sad news. spudmunkey wrote: BTW, good to see you Kevio. It's been a while since you had a chance to post. Bummer that it is around sad news. This news is kind of a shock. Good luck to the employees of Carvin Audio. And thanks to Kiesel Guitars for implementing more sustainable, ecologically-friendly production practices. Thanks - I'm always lurking, but always super-busy. However, anytime anyone needs anything, just reach out - I'm always right here. It shows Mark and Jeff did the right thing. The Vai question is a good one. I think he'll still use his legacies since he has mentioned that with the release of his last album, and the anniversary album, that he's going to slow down his touring schedule. If he's going to slow touring, it means that he won't want a new endorsement deal and he's going to head into at least semi-retirement. If Carvin Audio made the active electronics for the DC, JB200C, etc, then it makes sense why Kiesel discontinued it...and if there wasn't a lot of up-take on it once it was made optional, it made sense not to have someone else design-from-scratch a new system (since I assume they couldn't have someone else make Carvin's design). Last edited by spudmunkey on Mon Oct 09, 2017 4:15 pm, edited 1 time in total. spudmunkey wrote: If Carvin Audio made the active electronics for the DC, JB200C, etc, then it makes sense why Kiesel discontinued it...and if there was a lot up-take on it once it was made optional, it made sense not to have someone else design-from-scratch a new system (since I assume they couldn't have someone else make Carvin's design). It makes sense, but Jeff is terrible at explaining things (like the pickup debacle). "Oh hurry and get it while you can, it's being discontinued. Oh and people probably won't like this decision." In this situation, he could have EASILY said "Because Carvin audio makes these boards and we are severing ties with them, we'll be discontinuing the active electronics." Easy, not a bad word in that, and a direct statement on the issue, without discussing internal politics. dejabluguitar wrote: It shows Mark and Jeff did the right thing. So glad they had the foresight and the guts to strike out on their own. Their father's legacy will continue. End of an era... again!!!! It is with a heavy heart that we announce that the Carvin Audio factory will be closing its doors after over 70 years. We are thankful for the many years we've had in this business and the support you all have given us. We'd like to thank all of you for your devotion to our gear and championing us live, in the studio, and on social media. We hope to see our gear live on in your musical lives for many years to come! Shortly, we will be making an announcement about our liquidation sale. I hope that amp designs like the X100 aren’t lost... they were something quite different than the millions of Fender/Marshall circuit variations out there. I've posted my thoughts in several different locations. I'll post my complete thoughts here. 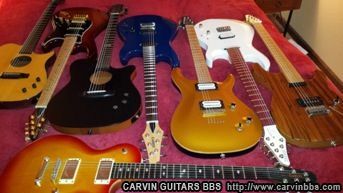 I'm saddened by the closing of Carvin. I was saddened when Kiesel split from from Carvin. There's a curiosity in human nature. There was always something that never seemed right with what happened. I rack my brain trying to figure it out. It seemed to me as if the family broke up. I can only speculate as to what led to the separation and the closing but I won't. I'm sad. I'll leave it at that. Some have already mentioned this but I'll add it in my thoughts anyway - The closing seems very sudden considering they just opened up a new showroom and factory within the past year. Did something happen very sudden? And there's no explanation. At the end of Jeff's last live video he stressed how much Kiesel is totally separate and has nothing to do with Carvin Audio. I now wonder if he knew they were closing and he said that to make sure people wouldn't associate Carvin's closing with Kiesel. I still think it's strange some of the things he said about Carvin but I can only speculate as to the reason. I wonder if Kiesel will buy out Carvin Audio? Is there even a market for the Carvin amps anymore? I've never played or owned one but from the demos I've heard they sound pretty good. The bass player in my band has a Carvin amp and 4x10 cab ind it's one of the best I've heard. It's not like they made junk. Was it the marketing or lack of consumer demand that lead to the closing? I have no idea, I can only speculate. I could ramble on and on but I'll stop. My curiosity is driving me crazy. I hope the staff at Carvin Audio has a bright future. I wish them the very best. Jeff's live on FB right now talking about this situation. Can somebody clear up a little bit of confusion? What does Jeff mean when he says the Carvin Guitars brand has not been retired? I can't get a "Carvin" guitar. For example, the CS6 was designed under Carvin. It's now being built by "Kiesel" Am I missing something? I'm so confused. What does he mean when the Carvin Guitar name will not be retired when I can no longer get a guitar branded Carvin? According to Tone King, Carvin closed their San Diego Factory, but Carson Kiesel's children are going to continue on with pedals, like their Legacy preamp pedal. Brock wrote: Can somebody clear up a little bit of confusion? What does Jeff mean when he says the Carvin Guitars brand has not been retired? He's saying two things at once again. He says he keeps it real, but he says two things at once and that doesn't make any darn sense. They still use Carvin Guitars as a brand. Granted, just on a couple models, but it doesn't seem "sketchy" or "purposefully confusing" to me. The CS6 was branded as Kiesel at least a year ago. It doesn't matter the name of the company when it was designed. They still have the Bolt, JB200C and PB (and maybe JB?) basses branded as Carvin. spudmunkey wrote: According to Tone King, Carvin closed their San Diego Factory, but Carson Kiesel's children are going to continue on with pedals, like their Legacy preamp pedal. Well, I think this is a better direction for the company. Pedals can be made cheaper and you can get amazing tones from pedals run through loaner amps. It's also a higher profit-margin market, and easier to be "boutique" and not price yourself out of the market. I'm not saying the Legacy pedal is the right price for the market, but it's easier to charge 100% margin on something cheap than something already pricy if for no other reason it's built in California, much less just in the US.